The Spinner's Book of Yarn Designs- Techniques for Creating 80 Yarns by Sarah Anderson took longer than expected to review because it's so good. If you spin yarn, or if you're a knitter or crocheter who is considering learning, you'll want this book. 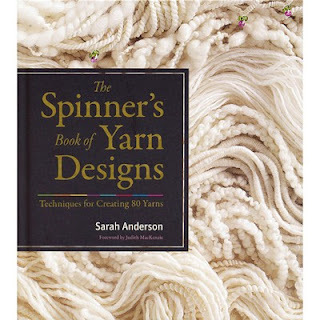 You won't learn how to spin with this book, what you'll learn is ways to make amazing and unique yarns. The introduction does have a lot of tips for spinning, buying tops and fleece, and even how to pick a whole fleece if you're willing to clean and card it. She also talks about carding methods which is important for both the types of yarn you want to spin and for color work from colored fiber. She shows ways to create colorways from the fiber batts that are just gorgeous. If color is your passion, you'll love seeing the wild batts she makes and the examples of things she makes from them. Then she gets into various ways to ply yarn to create wonderful textures and appearances. What makes this book fantastic other than the amount of detail and the well photographed images is her instructions and tips. She writes it very well and engagingly, making it very easy just to read it for artistic inspiration. She also has experimented with various plys and spinning styles to test durability for socks and those experiments are interesting to read. She tested them fairly by knitting a pair of matching socks, one with a control yarn and one with the yarn she was testing then wore them to see which wore out first and how. Those are also very well photographed. My favorite chapter is techniques that a little beyond my abilities right now. The final chapter combines color and texture to create beehives and other types of really gorgeous novelty yarns that make my fingers itch to want to try in a simple knit design. You will learn how to make loops, slubs, spirals, and beaded accents on your hand spun yarns and enjoy the great examples of what can be done with the finished yarn. If spinning is something you want to learn, or that you already do, this book is eye candy, inspiration and instruction. Published by Storey Publishing- Like them on Facebook for free recipes, craft projects and contests to win books.